Viscosity is a key differentiator in separating and grading the full range of petroleum as well as biofuel refinery products. Unfortunately, fluctuations in material and process characteristics present significant challenges for measurement accuracy from crudes to aromatics to lube oils to asphalts. Inaccuracies and delays in viscosity measurement slow throughput, require extra plant capacity, and significantly raise refining costs. Biodiesel has its own special challenges. If the viscosity spikes, it usually means that un-reacted material is going through the line. Cambridge Viscosity’s system sounds an alarm when the viscosity spikes, alerting the operator to make the appropriate adjustments before the quality of the product can be negatively affected. 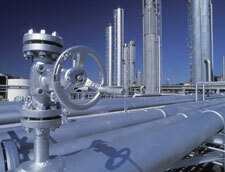 Cambridge viscosity analyzers function accurately and reliably at the full range of refinery and transport temperatures. They also automatically calculate temperature- compensated viscosity and pressure-compensated viscosity, ensuring accurate results no matter how harsh the conditions. Due to our innovative design, Cambridge Viscosity sensors are in direct contact with the material and self-cleaning, ensuring low maintenance costs and downtime. Furthermore, samples can be tested in-line, reducing the inconsistencies and evaporation caused by taking samples for off-line analysis. Robust, durable, and with self-cleaning capabilities, our viscosity analyzers are designed to support the unique requirements of the refining and petroleum industries. Visit our process viscometer pages for more information. Visit our laboratory viscometer pages for more information. We invite you to contact us for additional information on your application.